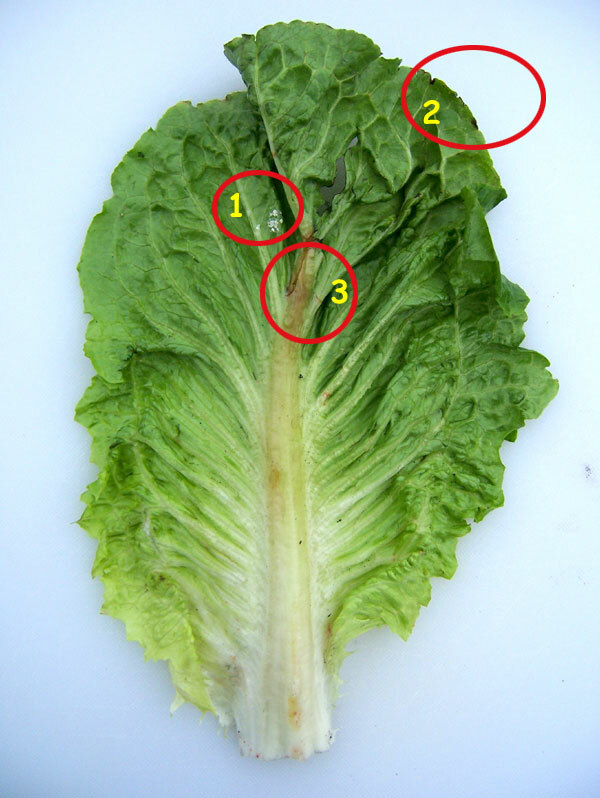 Take a look at this picture below, of Romaine, and see if you can identify the three defects circled. Now if you found this leaf on a plant of romaine, would the plant be considered a defect? If you reviewed the USDA Grade Standards for Romaine, you find a very generic definition stating, if a combination of defects materially affects the appearance, then it would be scored as a defect, as damage. So, do these defects pictured above materially affect the appearance? Downy Mildew can be recognized by sharply defined angular spots, yellowish to brown in color on the upper side of the leaf while the lower surfaces often show a whitish mold growth. The outer leaves are generally affected first. The injury will sometimes break down into decay in transit. Score as damage by Downy Mildew when materially detracting from the appearance on any leaf. Score as serious damage when materially detracting from the appearance on more than 2 leaves. Yellow, brown, or reddish brown discoloration is scored as damage when more than 2 leaves are materially discolored; and scored as serious damage when more than 4 leaves are seriously discolored. Score as damage when more than 2 leaves are materially bruised. Score as serious damage when more than 4 leaves are badly bruised or the plant is so badly forced out of shape that the structure of the plant has broken down. Plants which have been bruised to the extent that they are damaged will often show a reddish brown discoloration or a watersoaked appearance in the bruised area. In describing bruising which shows reddish brown discoloration, it should be reported on the certificate as “discoloration following bruising” since in most cases the discoloration will be responsible for the plant being damaged. 1) From what we can decipher, the downy mildew would have to materially affect the appearance, and the small spot above is barely noticeable. But is that enough to be considered as a defect? The answer is yes, the downy mildew alone would make this plant a defect. 2) How about defect #2, the discoloration affecting the margins of the outer leaves? No, you would need considerably more discoloration, and the discoloration would have to be affecting at least three leaves (more than 2). 3) And defect #3, the bruising, is that enough of a bruise to be a defect. Maybe…..only if two more leaves were found to also have bruising. This is Rib Discoloration, affecting the midrib. Sometimes the discoloration will branch out into the veins of the leaf. This alone would be enough to be considered a defect, damage by rib discoloration. 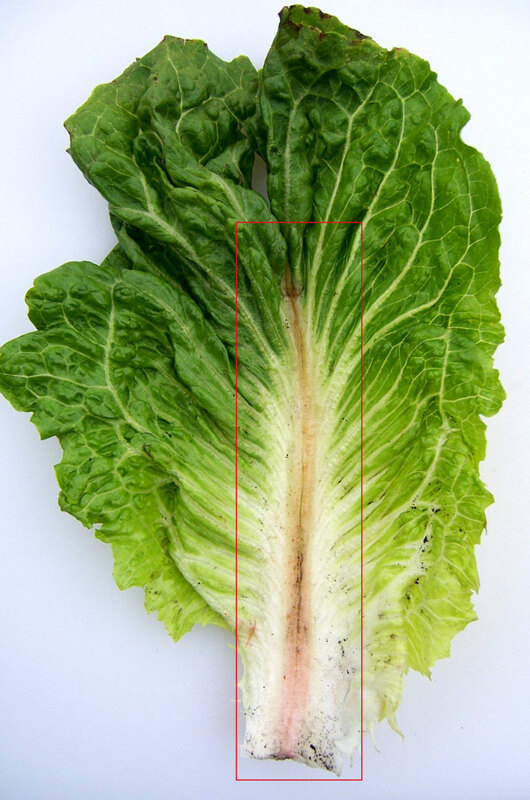 Be careful when inspecting Romaine, Green Leaf, Red Leaf or Iceberg Lettuce, always look at the inside of leaves for defects which may not be evident from the outside. Will this discoloration turn into decay? Since the area is now infected, producing the discoloration, it is more prone to breaking down into decay, than a healthy leaf. I was inspecting Romaine just yesterday, and came across yellow spots on the leaves (discoloration). Would this be a defect, and what may have caused this? Yes, discoloration may appear in many forms, yellow, brown or black. Without seeing some pictures it would be difficult to say what caused the discoloration, but usually warm (hot) weather is the culprit. But remember, the discoloration must materially affect the appearance of the plant on more than 2 leaves before scoring this as a defect. Thanks for the question!